How to make a cute Dala horse with an American twist using all recycled materials! My husband is part of the first generation of his family that was born in the United States. 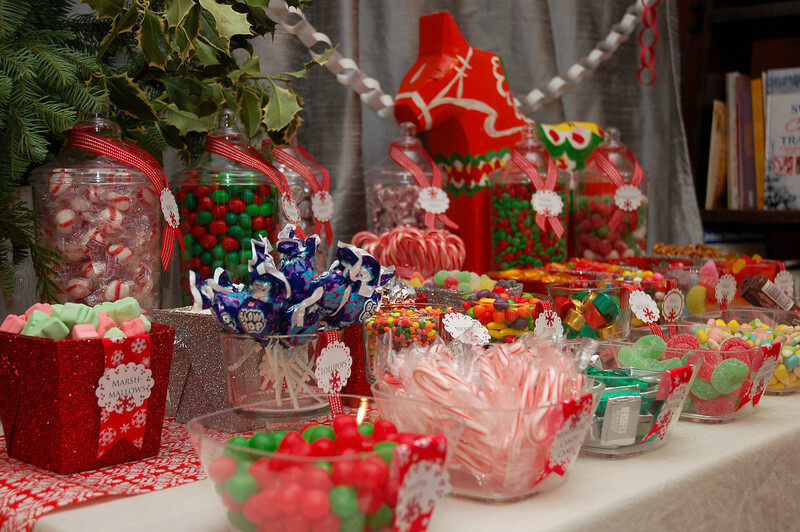 Over the years we have found a happy blend of family traditions when it comes to decorating for Christmas. In a previous post I discussed traditional Swedish Christmas ornaments and showed you how to make a Swedish Advent Star (see: How to Create Swedish Advent Stars Using Recycled Book Pages). Today I would like to share with you another decorative Swedish item that can be made with book pages and other recycled materials: the Dalahäst or Dala horse. 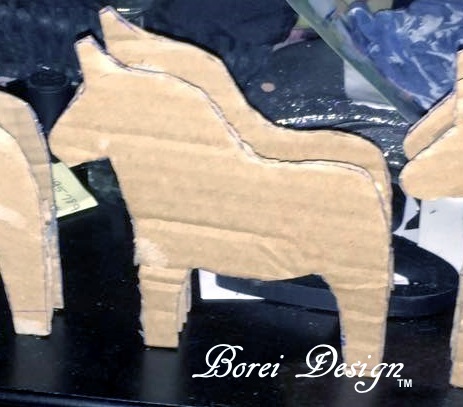 Swedish Dala horses have become so well known and admired, that they are often today seen as a symbol of Sweden itself. They were traditionally hand carved from wood and then hand painted. Most were painted primarily red with beautiful, colorful accents but I have also seen traditional Dala horses in black, blue and even orange. 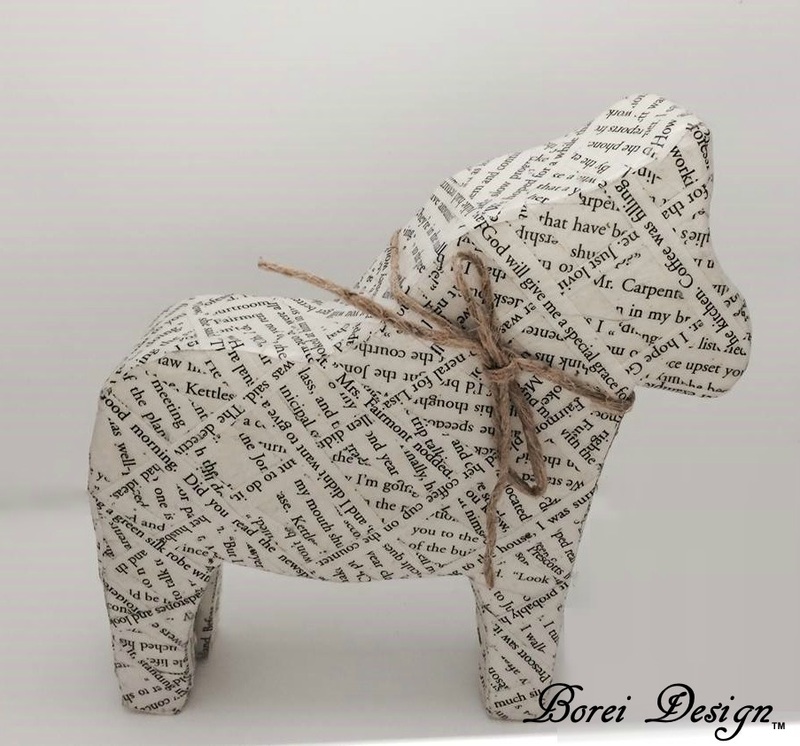 Today Dala horses are popping up made of many different types of materials, patterns and colors. 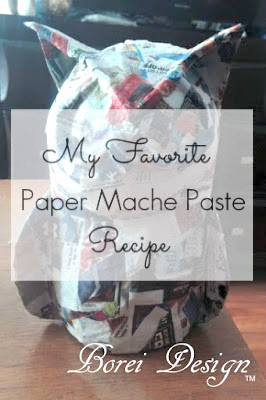 Here is how I recently made a paper mache one for my home that I truly thinks help to represent this generation of the family. 1. I first traced and cut two Dala horses from heavy cardboard. There's lots of freebie patterns online for tracing or you can use this one that I uploaded in word format to google docs. 2. 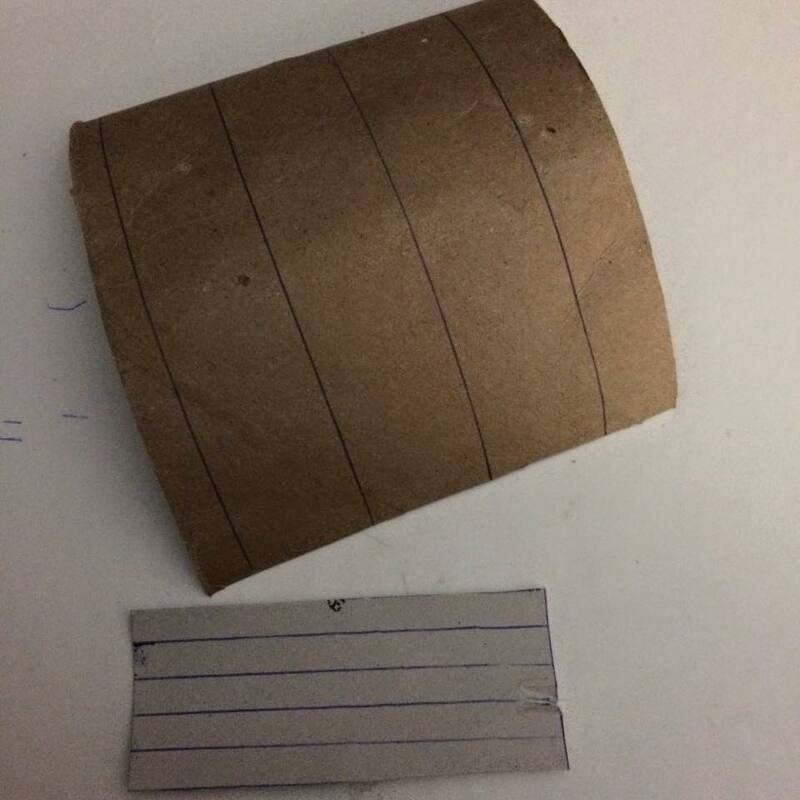 I cut open empty toilet tissue tubes, I marked 1 inch wide sections and 1/4 inch wide sections. I then cut on the marked lines to make strips and secured each strip closed in a ring again with hot glue. 3 I glued 1" loops inside the body on one side of the Dala cutout. I glued the 1/4" loops in each of the legs on both sides. See below. 4. I glued the two sides together with the loops sides facing inward. 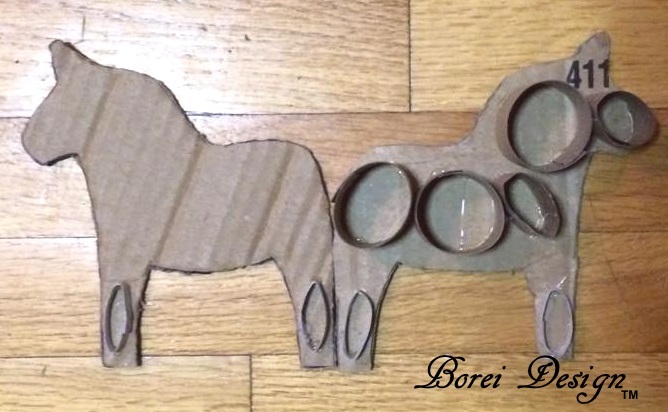 The 1" wide loops should touch both sides of the horse when put together but the 1/4" loops will not. This separation is made so you can create four separate legs. This completed my base form. Update note: you can glue strips of flexible cardboard (like from a cereal box or poster board) around the open edges (between the the two sides) and around the inside of the legs to help reinforce and close the frame, if desired. 5. 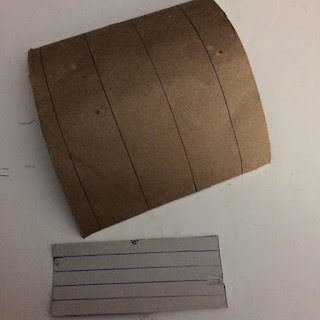 I wrapped several layers of old wrapping paper strips dipped in paste around the form, making sure to wrap the four legs separately (below the belly). Once all was dry I rubbed the bottom of the hooves with sandpaper to even out any places the feet were not flush to the surface when standing on a table. 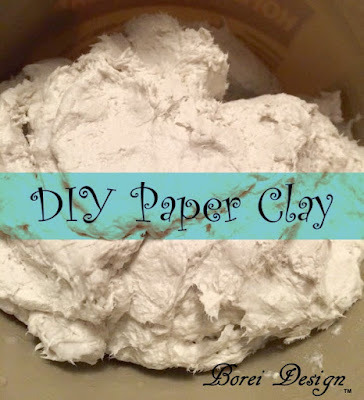 For additional details on this process including a recipe for paste, see my post: How To Make The Perfect Paper Mache Pumpkin for Fall. 6. 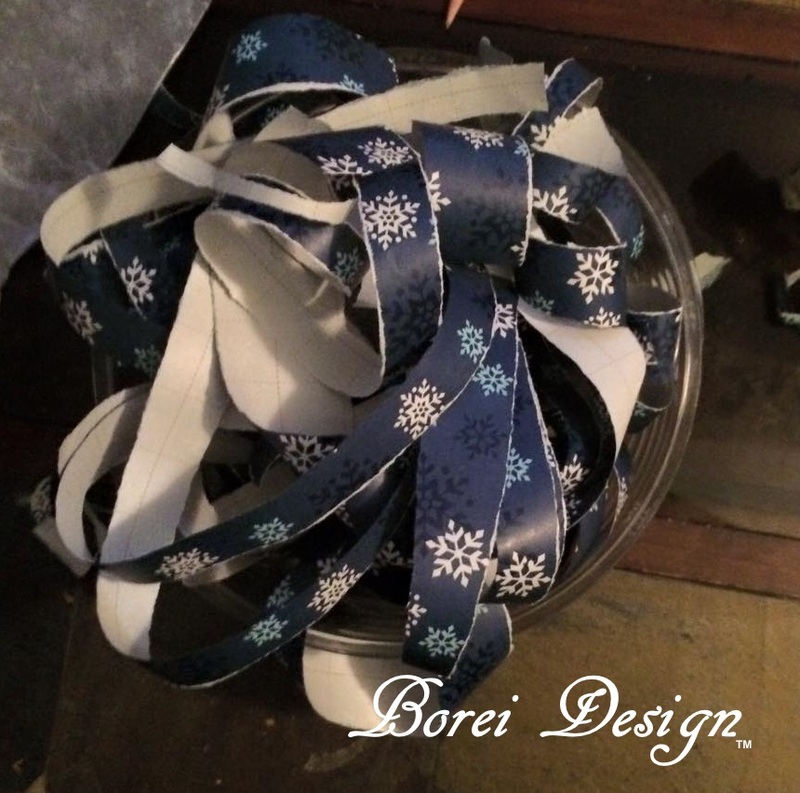 I cut strips from an old book that was ready for recycle. 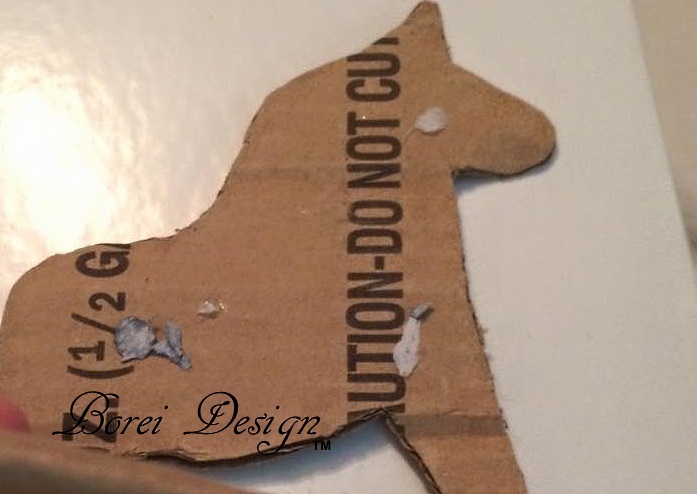 I glued the strips to the horse using Mod Podge and added a couple coats on top for sealing. Once the Mod Podge dried I wrapped a piece of twine around its neck and tied it into a bow and it was all finished. 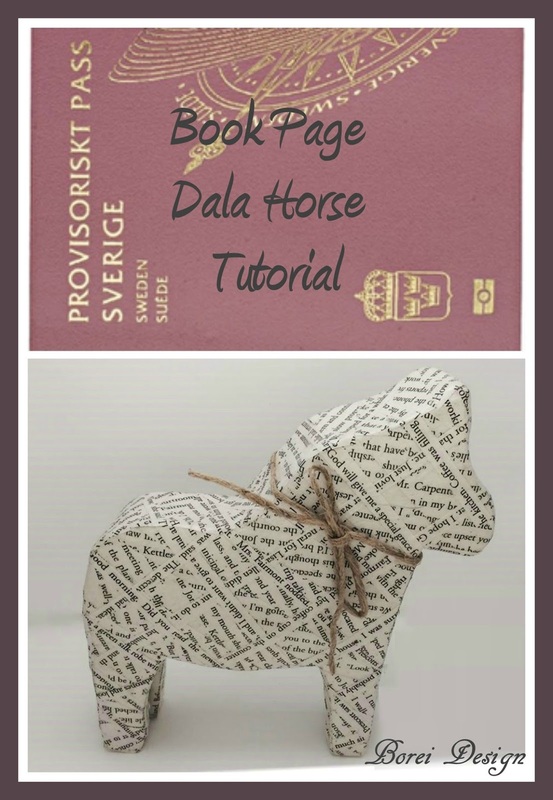 For more information on the fascinating history of Dala horses check out this website. Update: While I chose a different medium and added an American spin on my Dala, a blogger friend of mine went completely traditional with both method and design. Her AMAZING, hand carved and painted Dala can be seen on display in her Swedish Themed Gingerbread Party post. Be sure to check it out! 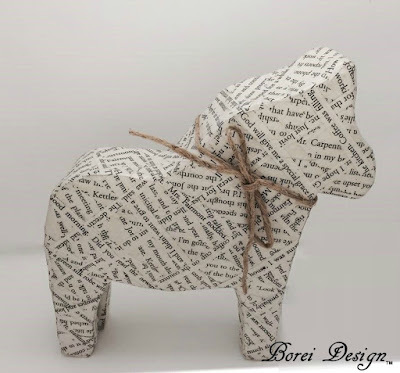 I love love LOVE your papier mache dala horse! Now I want to make a REALLY big one. Like, life size. I have no idea what I'd do with it, or where I'd put it, but I just love your technique so much! Thank you so much for this tutorial, I love it and will use it one of these days.